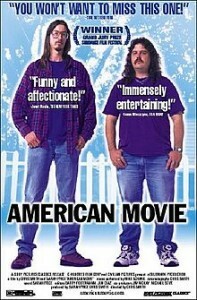 Sundance Grand Jury Prize-winner (1999) “American Movie” today received the Cinema Eye Legacy Award. The film was edited by our own Barry Poltermann, working with co-editor Jun Diaz. At an awards lunch in Manhattan, Chris Smith (director/producer) accepted the award. There will also be a screening of the film at Hot Docs in Toronto with a special Q&A with Smith afterwards. Previous Legacy Award honorees have been “Sherman’s March” (2010), “Grey Gardens” (2011), “Titicut Follies” (2012), “The War Room” (2013), “Harlan County, USA” (2014) and “Paris is Burning” (2015). The Cinema Eye Honors for Nonfiction Filmmaking were founded in late 2007 to recognize and honor exemplary craft and innovation in nonfiction film. Cinema Eye’s mission is to advocate for, recognize and promote the highest commitment to rigor and artistry in the nonfiction field.